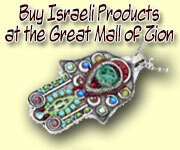 Shop and Support Israel at the Zionist Mall! Tourists: Don't spend more at some overpriced souvenir shop! Buy the same items here for a fraction of the price!